How to make beer bread? Beer bread is very delicious. The texture of the beer bread is soft, and the aroma of the beer is very rich. With the wheat flavor of the flour, the flavor is unique. Beer bread is fermented by direct method. It is not necessary to prepare the starter one night in advance, which is short-lived and suitable for friends who do not have enough time. Today, YoLong introduced how to make beer bread. Knead into dough: In addition to salt and flour, all other materials were mixed and stirred at a low speed for 1 minute with a blender until the flour was sufficiently wet and roughly shaped. Put the dough in the bowl, cover the bowl with plastic wrap and let stand for 20 minutes.Sprinkle the salt and stir with a blender for 7 minutes at medium speed. If the dough can’t get out of the tank wall, add some flour.The final dough will be very smooth and elastic. If it is still very sticky, add a little flour . If the dough is too hard, put some water. Fermentation: Put some oil into the container, put in the dough, and seal the plastic wrap. Wait until the dough is fermented to a height of 2 times. It takes about 1.5-2 hours (ideal temperature is 24-27 °C). Shaping: The dough is buckled on a workbench with a little flour, gently flattened, rolled into a ball or shaped into other shapes. Last fermentation: Fermentation until the volume is almost doubled, the time is about 1-1.5 hours. After the fermentation is complete, gently press the dough with your fingertips and the depression will slowly rebound. Oven preheating: Preheat the oven to 232 °C 1 hour in advance, this step should be carried out simultaneously at the end of the fermentation. Final: Powdering and dicing the fermented dough. Baking: Bake in the oven for 15 minutes, the temperature drops to 204 ° C, continue to bake for 30-40 minutes, until the bread turns golden brown, you can release. Cooling: The baked bread is left to cool for a while and then sliced. This bread requires the use of slate (accumulated heat) and baking stones (making steam). The sugar in the raw material can be replaced by saccharified malt powder or maltose syrup, and the amount is also 1 tbp. Beer has foam, so the volume is difficult to measure, so it is best to use the weighing method for measurement. Because the dark beer is darker, adding honey will make the color deeper. Congratulations, the delicious beer bread is finished. We can share the beer bread to our friends, great! https://yolongbrewtech.com/wp-content/uploads/2018/10/beer-bread.jpg 407 600 yolongbrewtech https://yolongbrewtech.com/wp-content/uploads/2018/06/logo-s.png yolongbrewtech2018-10-15 06:36:102019-03-19 04:00:19How to make beer bread? Longing for your IPA and the heady bouquet of pale ale? Enjoy the sensation that your nose is full of it? Want to make the alchemist’s lintopper dry drop in your own beer? Here are 10 things that, if done, will add to your bouquet. 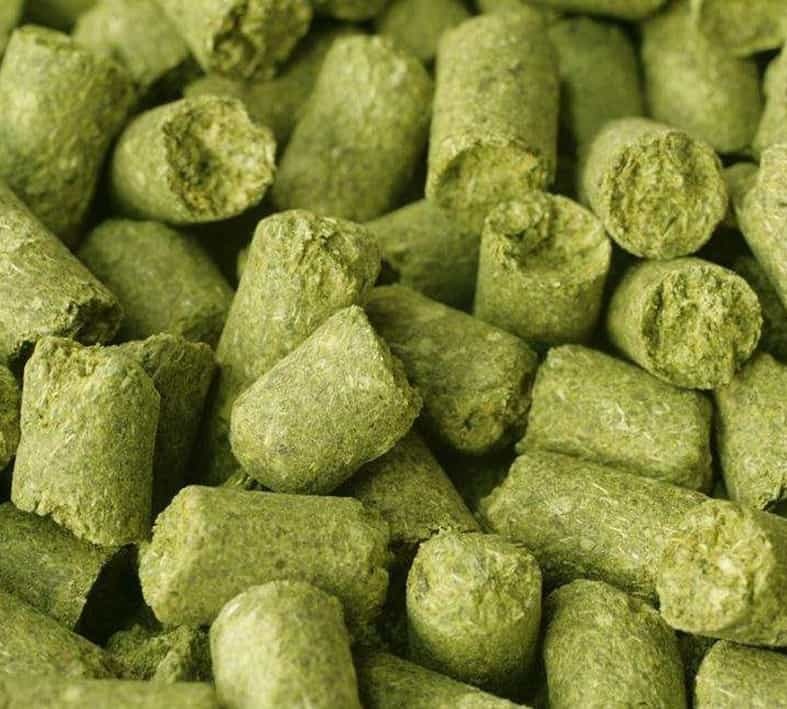 According to research by Peter Wolfe (Oregon state university) and Mitch Steele (Stone Brewing), hop-grain is the most widely used dry thrower in the United States.While some brewers are still debating whether grains are good or not, there’s no denying the fact that particle hops extract faster and better than dried ones. Like salt and pepper, different varieties of hops should work together. Whether it’s Simcoe and Amarillo, Citra and Centennial, Chinook and Cascade, or Nelson Sauvin and Columbus, two or more hops can give your beer a better depth. In fact, you’ll find that you have to find a balance between multiple hops, or some of them will overwrite other features. According to Steele, Vinnie Cilurzo (Russian river winery), Matt Brynildson (firestone walker winery) and Jamil Zainasheff (Heretic winery), multi-stage dry drop hops will add greater depth to your beer. Raised to the scale of commercial production, the need for multistage dry drop is straightforward: the shape of the cylindrical fermentation tank results in very small areas of contact between hops and liquid at the bottom of the tank. Wolfe doesn’t believe the technology can be of much benefit to home-brewed beer, as many fermenters use flat pans. As far as I’m concerned, I’ve noticed some obvious differences between what I’m doing with first-level dry throws and what I’m doing with multiple-level dry throws. 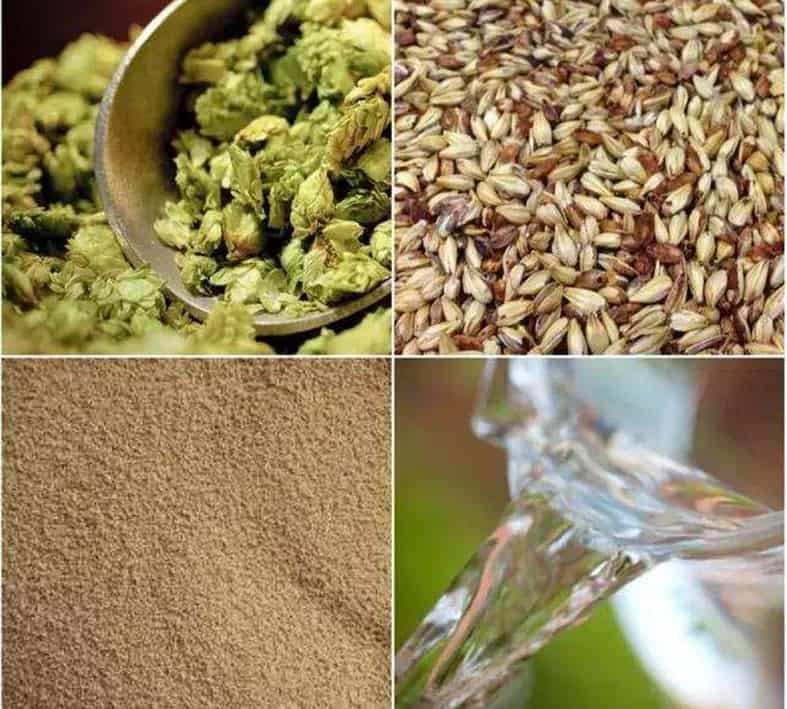 The higher the drying temperature, the better the aroma.In “For The Love of Hops,” author Stan Hieronymus reports on dry Hops temperatures at commercial breweries: Stone at 16.7 degrees, Lagunitas at 21.1 degrees, new Belgium at 12.2 degrees, and sierra Nevada at 20 degrees. Even breweries, like Jack’s Abby, raise the temperature to 13 degrees during dry spells. For me, I find it easiest to dry drop hops at ambient fermentation temperatures (18.9-20 degrees). Many commercial breweries have the ability to awaken hops, keeping them suspended in the liquid by means of hops or torpedo-like equipment. According to Wolfe, unawakened hops particles will only reach 3/4 of the aroma intensity of awakened hops (a peak of 4 days). 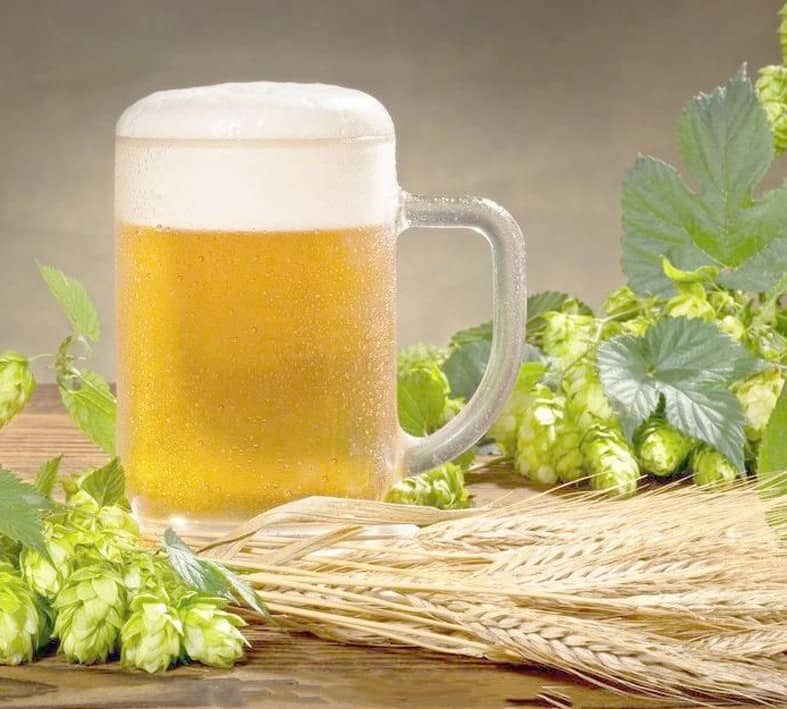 Most breweries dry drop hops after the main fermentation to prevent the yeast from absorbing the hops flavor and passing the flavor to the yeast used in subsequent batches. Some breweries have publicly ignored this dogma, dry-throwing hops at the end of the main fermentation. Lagunitas, new Belgium, sierra Nevada and firestone walkers do some (all) of the dry throwing of hops before reaching the finishing point. Some brewery likes this approach because it takes advantage of the interaction between yeast and hops, reducing the oxidation of hops with the beer itself due to still-active yeasts. As any experienced brewer knows, minimizing oxygen uptake after fermentation is critical.For dry throw hops beer, this is essential!No matter how good your technique, it is essential to introduce oxygen during the cupping process.Reducing the total number of mature containers (secondary fermenters, kegs and bottles) is an easy way to reduce oxygen uptake.A better approach is to use the pond to purify all your equipment before transferring. The study by Van Havig of Rock Bottom revealed that the post-drop hops/cyclothem precipitation may be more effective than the dry drop in achieving a high level of hops aroma. First, his data showed that longer boiling followed by the addition of hops (cycloprecipitation) led to more hops flavor, aroma and perceived bitterness. Second, longer boiling resists more hops flavor than dry throwing alone, so beer flavors are best developed in a boiling pot. The aroma of dried hops does not increase exponentially with the addition of more hops. In fact, Having shows that brewers can reach a point of diminishing returns by dribbling hops. Many commercial distilleries report dry throw efficiencies of between 0.25 and 1.5 ounces per gallon (0.5 to 3 pounds per barrel), such as Stone, Lagunitas and new Belgium, which average 0.5 ounces per gallon (lb/BBL). It was a clear good start, but in fact I found it.1.5oz/gallon is the best standard for my American IPAs. Preliminary results showed that the Double IPAs used 0.78 ounces per gallon for 11 days, the IPA used 0.48 ounces per gallon for 9 days, and the black IPA averaged 0.4 ounces per gallon for 12 days. With the above methods in place, you can create a delicious beer bouquet. We must seriously consider before we do anything, especially when we will start a microbrewery. What equipment do you need to buy for the brewery? What should you pay attention? It is the biggest concern for entrepreneurs who have just stepped into the beer brewing industry. Next, I will explain to you the specific process and equipment needed to open a micro-brewery. We need to find a workshop for producing beer. The location of the workshop is very important. Generally, our brewery needs to have a workshop, a filling workshop, a distribution workshop, a conveyor workshop, a fermentation workshop, a brewing workshop, the boiler workshop. Generally, the area of the micro brewery should be between 600 and 1200 square meters. Step 2: Choose microbrewery equipment. It is the most important stage. Buying a fermenter and brewing system are essential elements for brewing beer. Some large breweries have a fermenter capacity of several hundred tons or more, for small breweries can choose brewing equipment according to their own needs. The raw material pulverising system includes two parts of malt pulverisation and auxiliary pulverisation, and the pulverisation method is further divided into dry pulverization and wet pulverization. The dry crushing system includes: selection machines, vacuum cleaners, hoists, crushers, silos and accessories. (1) Selecting machine: Use a vibrating screen to remove impurities and use a magnet to remove the iron. (2) Vacuum cleaner: Use a pneumatic dust suction device to absorb and discharge dust and recover the usable powder. (3) Hoist: Use the bucket or vacuum negative pressure principle to increase the feed supply to the crusher. (4) Grinder: It is divided into a pair of rolls, three rolls, four rolls, five rolls, six rolls and other models to pulverise raw materials and auxiliary materials. (5) Tanks: The crushed malt powder or supplemental powder is temporarily stored in the corresponding Tanks as a temporary storage tank for beer saccharification raw materials. 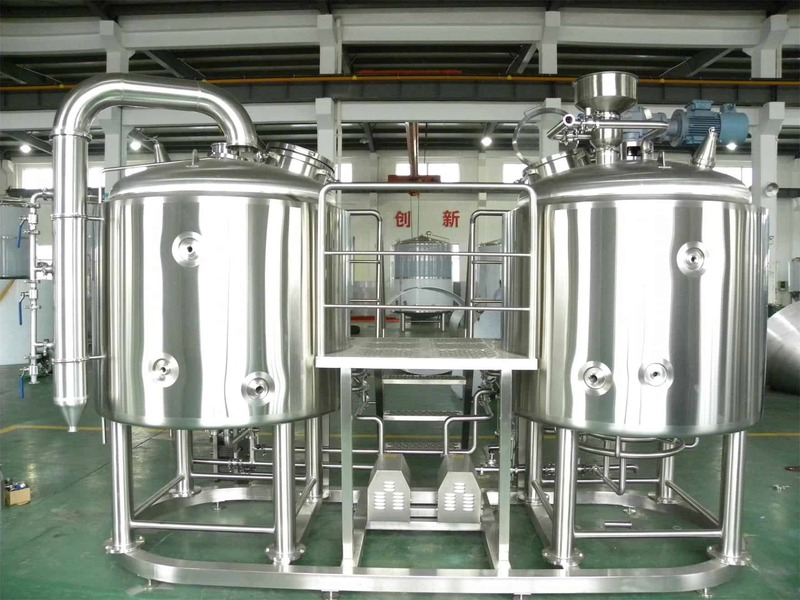 The brewing line of equipment other than the beer fermenter, usually refers to the beer brewing saccharification system; the beer saccharification system mainly consists of a saccharification pot, a gelatinisation pot, a filter tank, a boiling pot, a sedimentation tank composition. Yolong brewery equipment is the best choose. The main part of each pot/slot of the saccharification system is made of high quality 304 stainless steel material of international standard. Using modern automatic plasma, laser wire cutting and pure argon gas protection welding and other manufacturing techniques, all parts of the pot/slot main body that are in contact with the material such as wheat bran are mirror-polished and externally polished and polished to ensure that customers are provided with advanced technology, High quality, low price, luxurious and beautiful saccharification system. 1. Adopt high-efficiency Maitreya jacket heat exchange technology, apply scientific steam turbulence principle, realise the maximum heat conduction and energy saving effect, and adapt fully automatic temperature control technology to ensure heating speed and heat preservation in various process stages of saccharification and gelatinisation, The accuracy of time. 2. The international advanced suspension speed control system is adopted, and the frequency conversion and self-controlled stirring method are adopted to ensure the uniform mixing of the sputum during the gelatinization and saccharification process, and the most various enzymes in the process of gelatinization and saccharification can be maximised. Good biological activity and conversion, catalytic effect, to ensure the best quality and highest yield of beer at the source. 1. Adopt advanced scientific shaped cutter structure system and hydraulic automatic lifting technology to ensure smooth turning and smooth troughing, improve filtration speed and production efficiency, and maintain good transparency and juice yield of wort. 2. It adopts international advanced suspension and stirring device, combined with frequency conversion, speed regulation and automatic control technology to make the operation more convenient and flexible, simple maintenance and cost saving. 1. Apply advanced body boiling and pressurising technology to increase boiling strength, greatly increase the evaporation effect of dimethyl sulphide, promote the polymerization of protein and other condensables, and achieve rapid separation of boiled wort and polymer. 2 Adopting the extracorporeal circulation mixing technology to accelerate the heating rate in the initial stage of the wort boiling, so that the wort maintains a uniform temperature and uniformity during the heating process, and prevents the wort soluble matter in the region caused by local overheating, thereby ensuring the denaturation phenomenon,the boiling quality of the wort. 1 According to the optimal unit storage area, the storage volume of wheat grains is designed to enlarge the diameter-to-height ratio of the tank, reduce the swirling speed, promote the sedimentation and coagulation of the coagulum, and achieve the best separation. 2 coupled with a hot coagulum storage tank, can increase the yield of wort, but also reduce environmental pollution. 1 The hop adding system can be composed of two or more tanks, with pumping and accessories such as pipes and valves, and can also automatically control the amount of addition. 2 Cans, valves, pipes, etc. 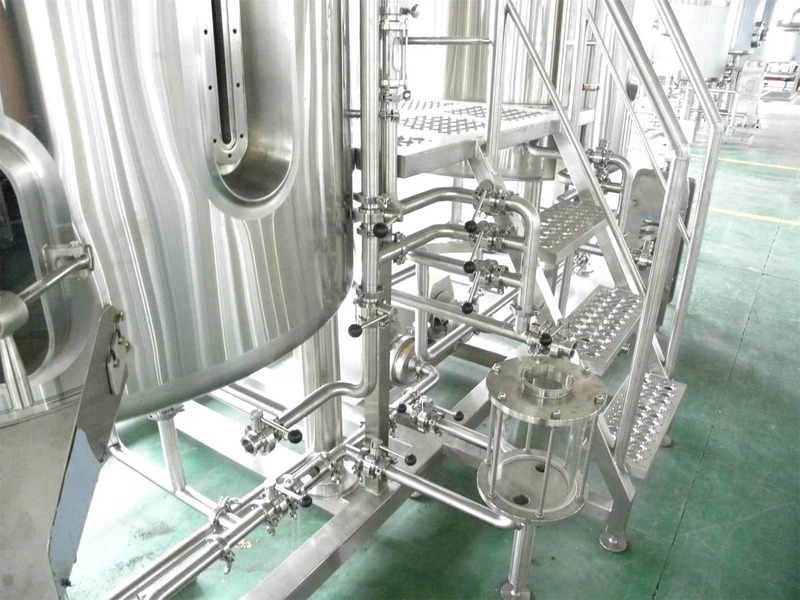 in the hop adding system can be connected to the CIP system for automatic, semi-automatic, cleaning and disinfection. 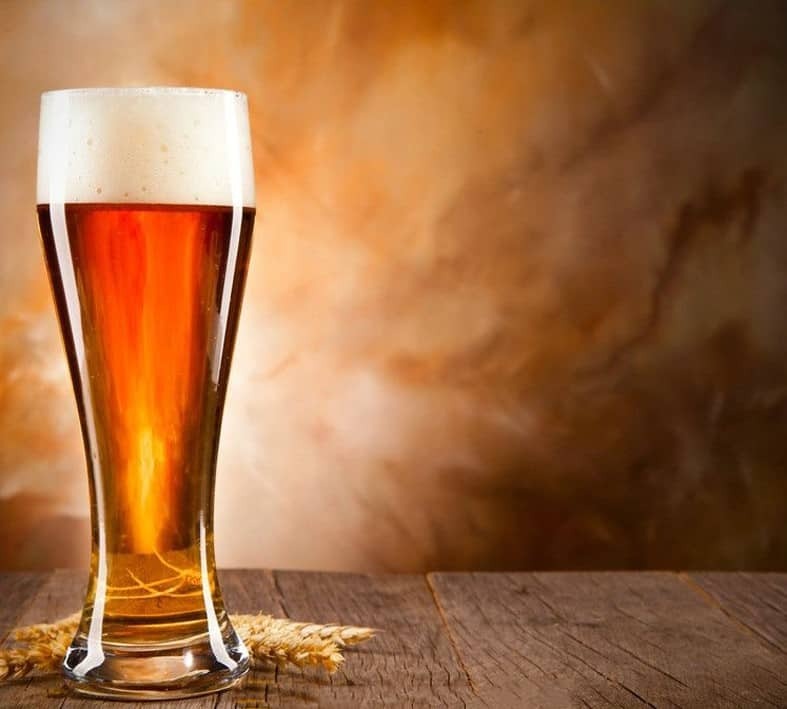 We recommend two kinds of beer equipment filters here, one is diatomaceous earth filter and the other is the membrane filter. Because of the different structural principles, the diatomite filter is divided into a column type diatomaceous earth filter and a plate-and-frame type diatomaceous earth filter, but the use principle and operation method are basically the same, and both contain a soil mixing tank and a soil supply pump. Automatic Control System. 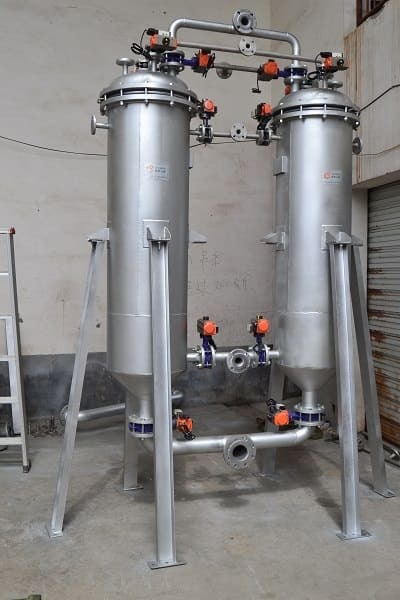 Membrane filter is generally a column structure, using two-machine parallel connection method, CO2 backup pressure, pumping wine, filter wine production, switching regeneration, cleaning, ensuring that each membrane filter filter column is regenerated and cleaned in time. Thereby continuous production can be achieved. The general regeneration steps are: automatic switching, normal temperature water cleaning for 5 minutes, warm water cleaning at 70 °C for 5 minutes, 2% 70 °C warm alkaline water cleaning for 25 minutes, 90 °C hot water sterilization for 30 minutes, natural cooling for 2 minutes, Pressure, stamping, spare. The filtered beer also requires beer storage. There are of course many things that are needed in the brewing line. The above is enough for a person who has just stepped into the beer equipment brewing industry to understand the learning. 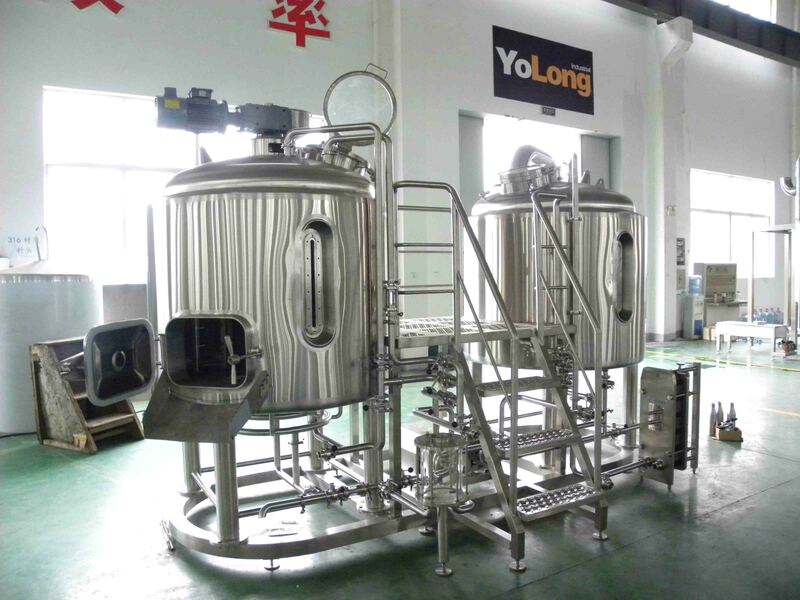 YoLong is advanced brewing equipment manufacturer, If you have any questions, please leave us a message or send us an email. 2018 china brew & beverage exhibition, we are coming! The CBB exhibition will be held from 23th to 26th in October on booth E2-C37 at the Shanghai new international expo. YoLong brings a 5bbl brewhouse on the exhibition this time. 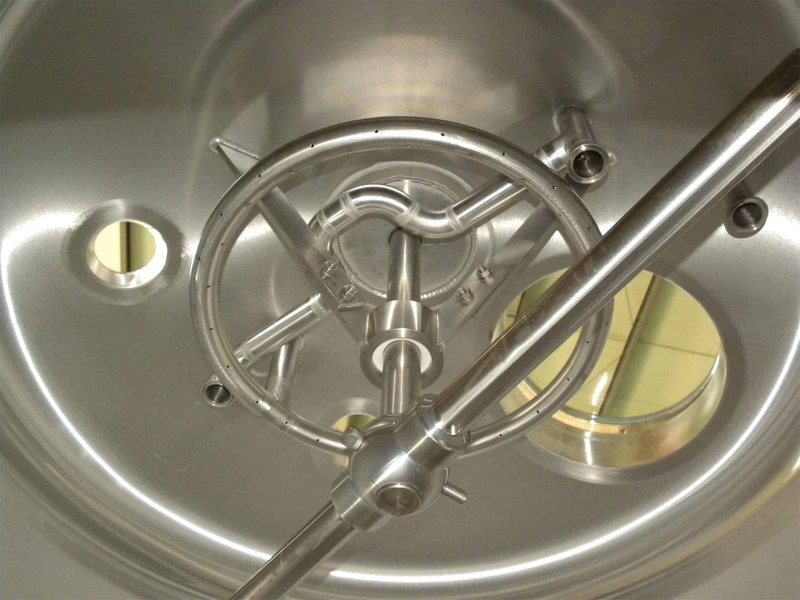 Brewhouse is designed for a cast-out wort quantity of 5bbl, which consists of, mash&lauter tun and kettle&whirlpool vessel, brewdeck, control cabinet, pipeline, pumps, PHE, and accessories valves. Mash/lauter tun is welded construction with top dished head, cylindrical tun with a conical bottom; all welding is done automatically under protection-gas atmosphere. kettle with dished top head, cylindrical tun with a conical bottom, all welding seams welded under a gas atmosphere. All the vessels will be mounted on a skid for the convenience of transportation. temperature automatic control for every tank with PLC & touch screen. if you are interested in this brewery system, please feel free to contact us. https://yolongbrewtech.com/wp-content/uploads/2018/10/7BBL-brewhouse.jpg 3000 4000 yolongbrewtech https://yolongbrewtech.com/wp-content/uploads/2018/06/logo-s.png yolongbrewtech2018-10-08 05:52:172018-10-11 01:52:022018 china brew & beverage exhibition, we are coming!